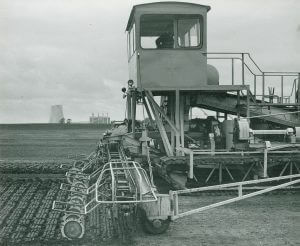 This machine was developed to produce high density small sods from the surface layer of the fields of milled peat bogs. and formed into a pile in the centre of the field. The foidin machine lifts the pile of peat by gathering spirals and bucket elevator, depositing it onto a conveyor belt which discharges into the macerator unit. The macerator is a single screw of large diameter at the intake end reduced in two stages to a smaller diameter at the delivery end. The macerated turf is extruded through a breeches spout delivering a triple sod to a spreader arm on either side of the macerator unit. The spreader arms comprise a frame carrying two roller type conveyor chains over two sprockets at either end. The chains running in the vertical plane each carry sod plates. These plates are retained in the horizontal position when passing along the bottom of the frame and, after tripping takes place, they are held open in the vertical plane until they pass around and beneath the leg of the breeches spout. Here the plates on both chains assume the horizontal position, their free ends almost meeting to form a platform to receive the triple sod. When the sod reaches the end of the spreader the plates trip in trap-door fashion to deposit the rows of sods at right angles to the length of the field. The machine is powered by two diesel engines, one driving the macerator and another driving all other units including the machine tracks. The foregoing equipment is supported on a main frame and superstructure fabricated in standard steel sections, which is carried on caterpillar type full tracks. Steering is by coil clutch and all other controls are operable from a spacious cab which overlooks the working parts of the machine. The spiral/bucket elevator unit is raised and lowered hydraulically to control peat intake and for idle travel. The spreader arms which are supported on long rollers while working are lifted hydraulically complete with rollers for travelling idle. Read about how we adapted Diggers to be able to withstand the harsh bog conditions.